Love them or hate them, IKEA is embraced by apartment dwellers all over the globe. What other superstore inspires a fun widget to turn your name into an IKEA furniture name? Or inspired others to dedicate hours of study to determine the naming convention of furniture categories? But, one-Klippan-does-not-fit-all. For those interested in personalizing and re-purposing their IKEA products, we have two convertible green-living recommendations. Here's a great, non-permanent solution for an apartment. You'll need an Akurum cupboard, a set of Applad doors, wooden food plates and discount drawer knobs. You should also secure a handy friend with a circular saw or, barring that, spring a few dollars for a cabinet maker to drill some circular holes for you. 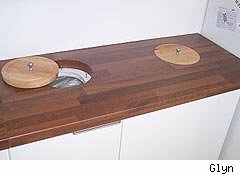 The wooden plates with knobs screwed in become the counter top's lid. 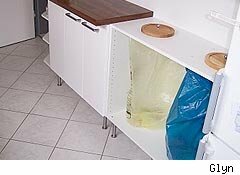 You gain additional work surface in your kitchen and neatly tuck the recyclables away at the same time. Step-by-step instructions here. If you have the gumption, and, your rental has a patio or other outdoor space (and the landlord's okay with an addition), well, you're in luck. 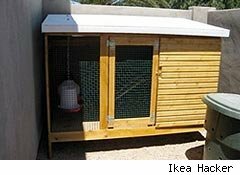 You're just an IKEA shopping trip away from fresh eggs courtesy of your very own chicken roost. You'll need a Mydal bunk bed, Trofast storage unit with shallow drawers, Vika Oleby legs, and a Gorm bottle rack. You'll need a few extras from the hardware store, such as wire mesh, and probably a few items to feed your chickens once their high-rise is complete. For the entire how-to, click here. Still eager to salute IKEA? Check out posts about the bookshelf-turned-bench, the handy iPhone app, and how to figure out if what you want is in stock.